The Oranienstrasse in Eastern Kreuzberg (aka SO 36) is probably the best known and most popular street in Kreuzberg – offering lots of stores, restaurants and bars (and several websites about it). Predominately the vibes are punk, alternative and Turkish – however especially in the summer it’s full of tourists and language students from all over Europe and the Americas, something that not all locals are excited about. Recently I’ve taken the M29 bus up and down that street a lot to get from one part of Kreuzberg to another. So I thought you might enjoy the first row perspective from the double-decker bus as much as I do. The video is sped up about 300%. Remember you can pause at any time if you want to look at something longer. The video was recorded around 8:30pm on a Tuesday. 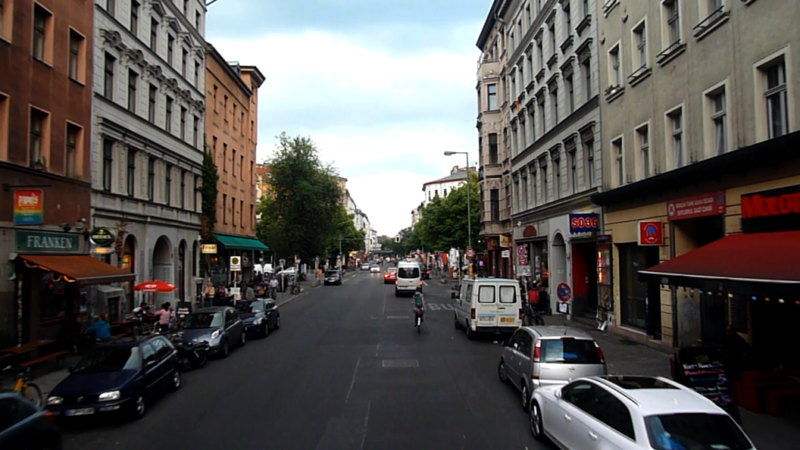 The main one-minute video shows just the part of Oranienstrasse from Oranienplatz to Görlitzer Bahnhof (heading East). The extended bonus video shows the entire ride from Hermannplatz to Moritzplatz and then back again from Moritzplatz to Spreewaldplatz. The music is called “Pieces of Me” and was written and performed by Jason Matherne, Sparky and Steve for GoonyGooGoo Productions. A Moving Postcard is a short video showing a place or an event. These are either 1-minute videos or longer versions of those videos - all shot and edited by me, Luci Westphal, a German New Yorker currently exploring Colorado and the Wild West. So go ahead, come on a short trip with me or send someone else a Moving Postcard. Become a patron and get exclusive rewards! Please check out some of the awesome people who support this series via Patreon and the great work they do themselves!